CLICK THE PICTURE TO PLEDGE WELLNESS! Michi's Ladder is a guideline for healthy nutrition. The higher up on the list you eat, the better off you'll be. We've also provided details as to whether these foods are good sources of protein (P), carbohydrates (C), or fat (F). You'll notice that tiers 4 and 5 don't contain this information—that's because these foods aren't healthy, so you shouldn't look to them for nutrition. They're "treats." Finally, if a food has an asterisk (*) before it, that means we consider it a nutrient-rich superfood. Note on frying: Foods should be eaten raw, steamed, grilled, poached, baked, or broiled. Frying automatically drops even the best foods into tier 5. RECEIVE FREE UPDATES REGARDING THE EIGHT WELLNESS CHALLENGES, PROGRAM & SERVICES. SIGN UP TODAY! FREE 30-DAYS OF UNLIMITED ACCESS TO BEACHBODY ON DEMAND! The Eight Nonprofit is an Independent Beachbody Coach in support of our mission. We invite you to become a Club Member for FREE or join as a Premium Club member. In doing so, you'll have unlimited access to Beachbody® On Demand for the next 30 days—absolutely FREE! Get All of These Trainers in the Convenience of Your HOME! Now you can stream hundreds of workouts directly to your computer, laptop, or mobile device, customize your own meal plans according to your preferences and goals, and get all the fitness and nutrition support you need to reach your goals faster than ever! IMAGINE HAVING ACCESS TO CELEBRITY TRAINERS 24/7. TRY BEACHBODY ON DEMAND! FREE FOR 30-DAYS! If you're not satisfied, just call Customer Service within 30 days to cancel and YOU OWE NOTHING, or cancel anytime thereafter to avoid future charges. For Nonprofits Please Download the Nonprofit Coach Application and the Business Entity Application. You will also need your IRS Exempt Determination Letter and Articles of Incorporation. Once complete contact us to get started as a Nonprofit Coach. When emailing us, please write "Nonprofit Coach" in the Subject window. Thanks. 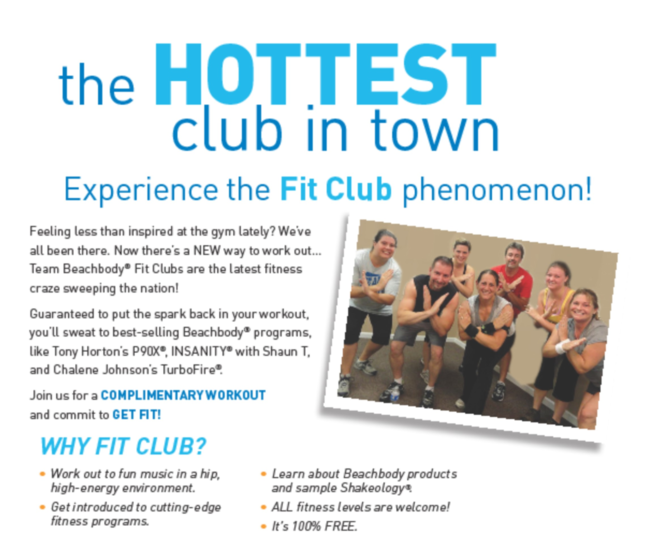 Are You Familiar with Insanity, P90, 21-Day Fix, Hip Hop Abs or Have Energy to Burn and Have the desire to Workout in a Group setting? If so, this opportunity if for YOU! The Eight is looking for people who love people, and have the ability to lead weekly Fit Clubs in your community. No professional experience necessary, just the ability to follow one of the many Beachbody Fitness Programs including the new CIZE , and of course Have Fun! Join our team Today! COMPLETE THE FORM ON TOP OF THIS PAGE.